Whatever your feelings regarding Facebook founder Mark Zuckerberg before seeing The Social Network, you’re bound to have them intensified. That’s because the film, which details the early days of the site, portrays the guy as both a nerd superhero and total jerk, and it’s up to the viewer to decide which label sticks. For me, it’s not an all or nothing answer, and I suspect I won’t be alone when I say I started on one side and moved more to the middle by film’s end, but never crossed all the way over. Regardless of where you come down on the debate, however, it’s hard to deny that The Social Network makes great entertainment out of one of this generation’s biggest Internet success stories. 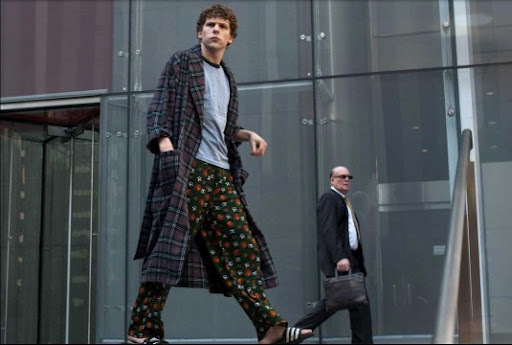 When the movie begins, it’s the fall of 2003, and Mark Zuckerberg (Jesse Eisenberg), a socially awkward Harvard sophomore who resents but longs to be part of the cool crowd, has just been dumped by his girlfriend. Drunk and seething with anger, he takes to the Internet, creating a site called Facemash, which asks his fellow students to compare their classmates and decide which is more attractive. Suffice it to say, the site is such a hit that it crashes the school’s server — and garners enough attention that soon Zuckerberg is approached by rich identical twins Tyler and Cameron Winklevoss (Armie Hammer, playing both roles), who want him to help them build an exclusive social network. Zuck has other plans, however, and he decides to build a separate site, a better site, thefacebook.com, which he hopes — he knows — will beat his privileged, cooler classmates at their own game. Yes, the site is a huge hit almost instantaneously. The Winklevoss twins believe Zuck stole their idea, and he rubs their nose in it by expanding thefacebook and growing it bigger and bigger — so big that it attracts the interest of Napster founder Shawn Parker (Justin Timberlake), who seizes the opportunity to make Facebook the billion-dollar company that Napster never was. By pursuing his goal so doggedly, Zuck reveals himself as being vengeful, selfish, and cruel. He not only ostracizes the Winklevoss twins, but by film’s end, he’s no longer friends with Saverin or partners with Parker. The Social Network was written by Aaron Sorkin, directed by David Fincher, and (loosely) based on the book The Accidental Billionaires, by Ben Mezrich, and like the book, it’s a fast-paced and highly enjoyable story, told in exciting and compelling fashion. The film uses two depositions (one with Saverin’s lawsuit, and one with the Winklevoss twins’ lawsuit) as a framing device, but sticks to a mostly linear narrative. Sure, the film gets a bit exhausting about 3/4 of the way in, but that’s because Sorkin packs so much into his screenplay, and Fincher manages to cram it all into this 120-minute-long film. In the lead roles, all are excellent. And yet, Eisenberg also shows some heart at Zuck’s core, some pain in his success, which only serves to put a fine-point on the irony of a guy with no friends who starts a huge network that’s centered around that very word. Did everything in the film happen as it’s shown? No. That said, as Jones’ character notes, “Creation myths need a devil.” By giving Zuck more of that role here than he had in reality and in Mezrich’s book, I think it only makes his legend grow larger — in a good way. 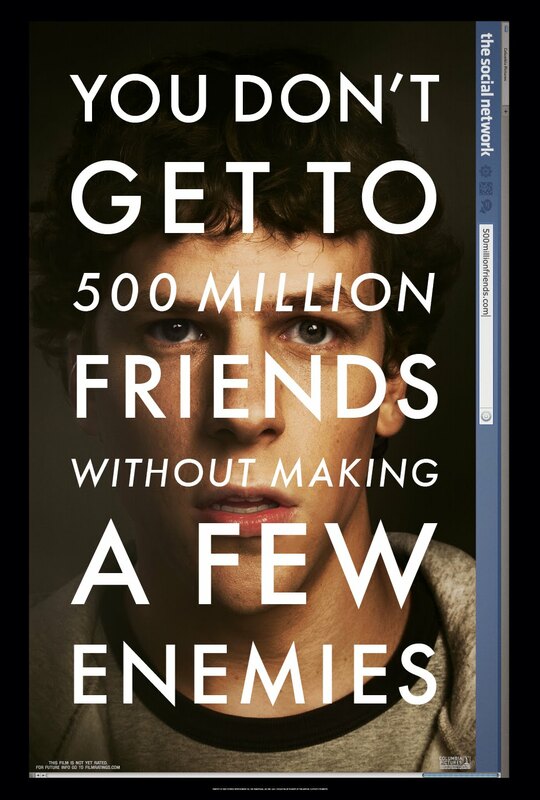 Call The Social Network the real Revenge of the Nerd if you will, but it’s clear from the film that Zuck’s the one having the last laugh right now, with few regrets. I’m giving The Social Network an A–, and I look forward to seeing it again. ← No Perks, No Power … No Point?